News — Foxhole Technology, Inc.
Charity Golf Tournament Nets More Than $10,000 for Operation Homefront. The first annual Foxhole Technology Charity Golf Tournament was held on Monday, October 22, 2018 at Mount Vernon Country Club in Alexandria, VA. With proceeds benefitting Operation Homefront, winners of the modified scramble tournament were the team of Ira Ludwick, Jim Singerling, Mike Rutkowski, and Stewart Kerr with a score of 62. Finishing second at 66 was the team of Kyle Armeny, Paul Pitcovich, Mark Price and Andrew Woodruff. Kyle Armeny also won closest to pin on the sixth hole at 22.5 feet and the long drive went to Gary Morris. Operation Homefront is a national 501(c)(3) nonprofit whose mission is to build strong, stable, and secure military families so they can thrive — not simply struggle to get by — in the communities they have worked so hard to protect. At the post tournament luncheon and awards ceremony, Wes Hester, CEO, Foxhole Technology (center) presented Bruce Anderson (left) and Shannon Grynkewich (right) of Operation Homefront with a $10,000 donation check from proceeds from the golf tournament. Foxhole Technology is very pleased to report that we have been awarded the Pension Benefits Guaranty Corporation (PBGC), Blanket Purchase Agreement (BPA) to provide Risk Management Framework (RMF) processes for documenting, tracking, and reporting an information system’s mission areas, and the overall security and privacy risks to the agency – thereby improving information security and privacy risk management within the Corporation. The contract is a five-year Blanket Purchase Agreement (BPA) for Information Systems Security Support, under our GSA 70 Schedule, using our Highly Adaptive Cybersecurity Services (HACS) SIN for Risk and Vulnerability Assessment (SIN 132-45D). The period of performance is August 10, 2018 – August 9, 2023. The total ceiling price of the BPA is $18,000,000. Task Orders will be issued using Firm Fixed Price (FFP), Labor Hour (LH), Time and Materials (T&M), or a Hybrid consisting of a combination of the contract types. 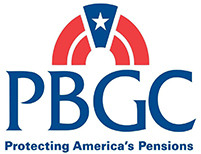 For this Task Order driven contract, we will leverage 13 labor categories to provide support to ensure services are: 1) in compliance with federal and agency requirements; 2) based upon the PBGC Risk Management Framework; 3) based upon the related requirements for project management; and 4) based upon related requirements for special projects – which could include, but may not be limited to, gap analysis, controls assessments, risk assessments, etc. Foxhole Technology has been awarded the Defense Information Systems Agency (DISA), Secure Configuration Management (SCM) Development and Operations contract. Awarded on the DISA Development and Business Center (DBC), Blanket Purchase Agreement (BPA), HC1028-17-A-0010, the contract provides a period of performance through June 19, 2021, with a 6-mpnth extension through December 18, 2021. 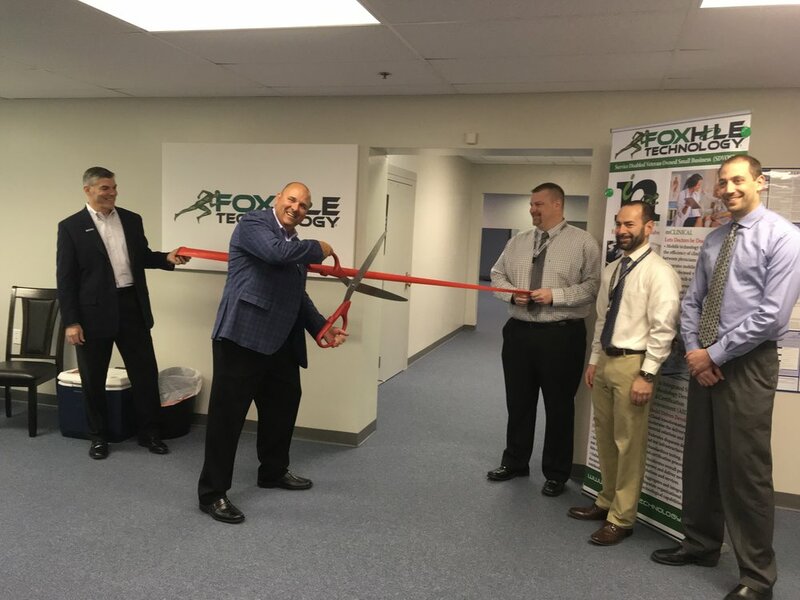 Foxhole Technology will provide services and support for the entire SCM portfolio – including the integration and optimization of enterprise cyber security applications, tools and data standards to support automated processes used in cyber blue force tracking, risk management, near-real time awareness of devices and software inventory and configurations. The SCM Core Systems for development and sustainment include: Asset Inventory Management Module (AIMM); Content Management and Content Infrastructure. The SCM portfolio dovetails perfectly with the long-term work Foxhole Technology currently provides on the DISA Continuous Monitoring and Risk Scoring Development and Sustainment (CMRS) contract (recently re-awarded to Foxhole Technology). Although CMRS is not part of the SCM portfolio, CMRS is the primary consumer of data from SCM portfolio tools, and is the data producer for other SCM portfolio tools. "We look forward to supporting the sustainment and enhancement of existing SCM capabilities, while also providing the rapid implementation of new features, updates and improvements – including the redesign of SCM capabilities to better meet operational requirements," stated Dee Rider, Program Manager, CMRS and SCM, Foxhole Technology. DISA DBC provides next generation, net-centric network operations (NetOps) and defensive cyber operations (DCO) capabilities for combatant commanders, joint/combined task forces, services, and agencies across the entire Department of Defense Information Network (DoDIN). In concert with the Department of Defense (DoD) migration to the Big Data Platform (BDP) concept, DoD programs are designated to provide the situational awareness by employing specialized components and analytic architectures that result in dynamic visualizations of potential and actual malicious trends and behavior. For more information, please contact Mark Cosgrove. Foxhole Technology has won its recompete for our current work on the DISA Continuous Monitoring and Risk Scoring (CMRS) Development and Sustainment program. Awarded on the Defense Information Systems Agency (DISA), Development and Business Center (DBC), Blanket Purchase Agreement (BPA), HC1028-17-A-0010, the contract provides a period of performance through May 4, 2022. Develop, sustain and maintain operational the CMRS application on the Microsoft .NET framework. Develop, sustain, and maintain CMRS analytics on the Cyber Situational Awareness Analytical Capabilities (CSAAC) Big Data Platform (BDP). Enhance CMRS application to include risk measurement (risk scoring) capability. Task Area 1 - Contract Level and TO Management Support [BPA Task Area 1]. Provide CO management support describing the technical approach, organizational resources, and management controls, transition plan, risk management plan to be implemented to meet the, performance, and schedule requirements through the contract execution. Task Area 2 - Software Design and Development [BPA Task Area 2]. 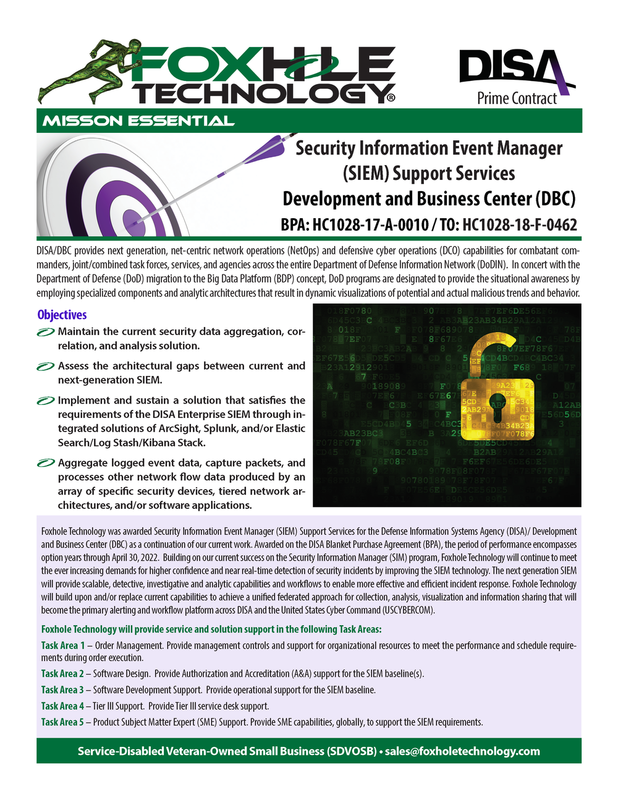 Provide requirements, development, testing, and deployment in support of CMRS. This effort will include gathering and managing operational, functional, and system requirements, conducting comprehensive testing, data acquisition and integration, and establishing a repeatable system engineering process, and managing users’ requirements. In addition, this includes engineering and deploying the solution to the appropriate hosting environment(s). Task Area 3 - Software Development Support [BPA Task Area 3]. Provide cyber security and A&A support. This effort will include supporting the security posture of the development, test, implementation, and production systems to maintain compliance with DoD regulations and Risk Management Framework (RMF). In addition, this task area includes configuration management, sustainment, and system administration support. Task Area 4 - Tier III Support [BPA Task Area 4]. Provide Tier III service desk support for after hour operational issues, and operational support activities, and operations support for operationally-focused program activities. Task Area 5 - Product Subject Matter Expert (SME) Support [BPA Task Area 5]. Provide in-person and/or virtual training sessions, and ad-hoc training. Serve as the expert in the areas of device and vulnerability data analysis and reporting, vulnerability management, continuous monitoring, risk scoring, CMRS strategy, and Secretary of Defense (SECDEF) Cybersecurity Scorecard support. Continuous Monitoring and Risk Scoring (CMRS) is a web based system that visualizes the cybersecurity risk of the Department of Defense (DoD) based on published asset inventory and compliance data. The risk state of the DoD Enterprise security controls for software inventory, antivirus configuration, Security Technical Implementation Guide (STIG), and Information Assurance Vulnerability Management (IAVM) vulnerability and patch compliance are measured and reported. CMRS supports the risk-management approach to cybersecurity oversight by quantitatively displaying an organization’s security posture through the use of risk dashboards. Using the risk dashboards, users can gather actionable direction, implement prioritized mitigation decisions, and ensure effectiveness of security controls in order to support their cybersecurity risk management duties. Foxhole Technology participated in North Carolina A&T’s Extreme IT Day activities at the University. Approximately 250 high school students from around the Greensboro, Raleigh/Durham, and Winston-Salem/High Point region with interests in technology attended the event. Students participated in five hands-on sessions, including the Marshmallow Challenge, Web Development, BlockChain, Robotics, App Development. Foxhole Technology co-sponsored the Marshmallow Challenge with Cisco. For each thirty-five minute session, with forty to fifty students in attendance, the activity brought four-five students together around a table, with instructions to build the tallest free-standing structure in 20 minutes – using only twenty sticks of uncooked spaghetti, a yard of string, a yard of tape, a marshmallow, and the small paper bag that the materials were stored in. The marshmallow had to be placed on the top of the structure. Sounds easy – but it wasn’t. The team with the tallest free-standing structure in each session received prizes from Foxhole Technologyand Cisco. 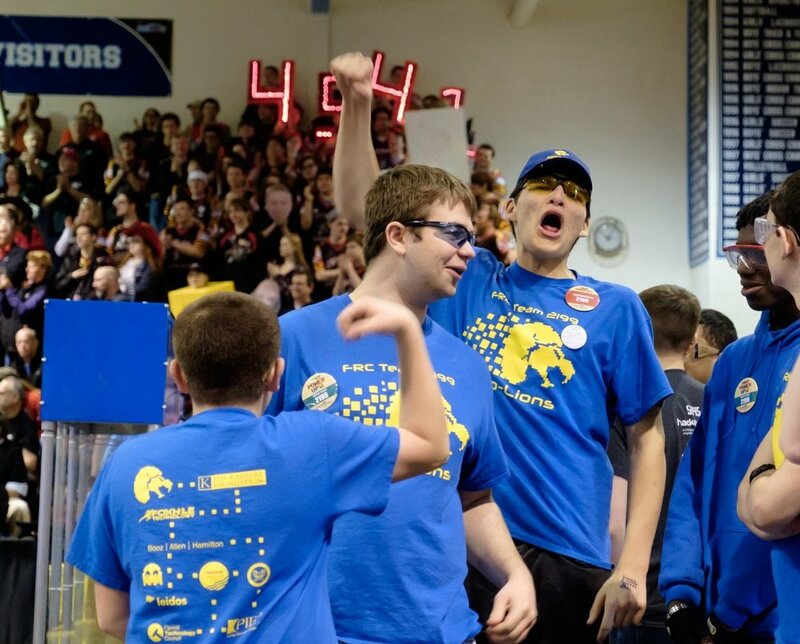 The remainder of each session was spent in open discussion about the challenges that the students faced during the structure build – the role that leadership plays in the activity; the benefits surrounding project planning, collaboration, and testing assumptions; and how each team handled time-ending pressures to complete their build. The tallest structure built was 21.5" tall. Copies of the Marshmallow Challenge Rules of Play and After-Event questions were given to the teacher/chaperones for each school. Each was encouraged to conduct a similar event in their classrooms -- a lessons-learned second attempt at building the structure, and discussing the values that the activity brings to each student. NC A&T University, founded in 1891, is the largest public Historically Black Colleges and Universities (HBCU) university in the country, and is nationally recognized as the largest producer of engineering degrees awarded to African Americans at the undergraduate level. Its Center for Academic Studies in Identify Science is the first and only National Intelligence Science and Technology CASIS (Center for the Advancement of Science in Space) in the United States.